* Sussex is a service community of 4,200 residents in Kings County, south central New Brunswick, Canada. This agricultural centre encompasses a service area of 35,000 residents. * Sussex is in the Atlantic Time Zone, putting it four hours behind Greenwich Mean Time during standard hours and three hours behind GMT during Daylight Savings Time. That means when it's 9 am in Sussex, it's 8 am in Toronto, 6 am in Calgary and 5 am in Vancouver. * We are on approximately the same latitude as Ottawa, Canada's capital city. * The town was incorporated in 1904. * Known as the "Dairytown" due to its strong agricultural heritage. 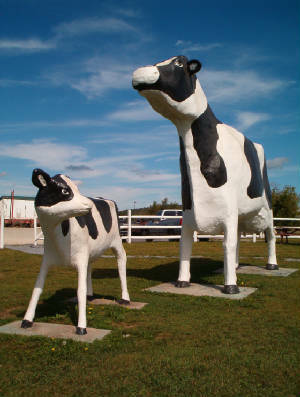 The Sussex area was producing more than half of the milk consumed in the Maritimes when the town was incorporated in 1904. * Our community is widely recognized as a model Canadian community. It's also one of the most popular stops for Royal visits. On the last such occasion, we were pleased to help Queen Elizabeth II celebrate her Golden Jubilee in 2002, with the town rolling out the red carpet on Oct. 12 to welcome Her Majesty. * The Sussex and Studholm Agricultural Society is the oldest co-operative movement in North America. Launched in 1841, it predates Confederation by 26 years. * Legend has it Sussex Vale businessman and politician Hugh McMonagle was pivotal in the creation of Canada. Sir John A. Macdonald was at an impasse in trying to create one nation from "sea to shining sea" when he set to work convincing McMonagle to join his cause. After much persuasion, he convinced the New Brunswick representative to switch political parties. The story is Macdonald wanted someone who had the strength of character and personality to withstand the fallout of such a shocking move. This gave Macdonald the numbers he needed to win the vote that lead to the Charlottetown conferences and the birth of Canada. * Canada's oldest agricultural fair takes place in Sussex each August. The Kings County Agricultural Fair celebrates 110 years on Aug 19-21, 2008. * The internationally recognized 4-H movement for youth got its start in New Brunswick here in Sussex. * Camp Sussex was the largest military training base in the region until the creation of CFB Gagetown. * Agriculture, retail and light manufacturing make up the local economy. * Eight of the 16 Kings County covered bridges are within a 10-minute drive of downtown Sussex. This is one of the reasons the area is known as the Covered Bridge Capital of Atlantic Canada. * The Town of Sussex, from the border it shares with Sussex Corner to the west end of Main Street, is 4.1 km wide. * Princess Louise Park, part of the former Camp Sussex military training ground in the centre of town, is 100 acres. Camp Sussex was originally 300 acres. * The Sussex industrial park, on Leonard Drive, is nearly 130 acres. * We are an hour's drive away from each of the province's three major cities of Fredericton, Moncton and Saint John. * Fundy National Park is half an hour away via Route 114, while another 20 minutes will get you to the shores of the world famous Bay of Fundy. * To see our Flowerpot or Hopewell Rocks, a great 75 min drive on Rte. 114 will get you there. * Poley Mountain Resort is just 10 minutes east of town. * Grand Lake, to the west, is 173.5 square km, and 30 m deep. * The Petitcodiac or "Chocolate" River winds along 129 km of New Brunswick countryside. The mighty Saint John River, which runs nearly the length of New Brunswick, is 673 km! The temperate climate places the region in the 5a and 5b Canadian plant hardiness zone. * Southern New Brunswick averages between 200 cm and 300 cm of snow per year. New Brunswick is the largest of the three Maritime provinces at 73,000 square kilometres. Approximately 85 per cent of that, or 6.1 million hectares, is forested. Our famous coastline, measuring 1,850 km, encompasses the internationally renowned Bay of Fundy. Approximately 750,000 people call New Brunswick home, with the City of Saint John being the largest urban centre (pop. 90,762). Moncton, in the east, is a close second (pop. 90,359), with our capital city, Fredericton, third (pop. 54,068). Anagance - AN - a - gance "a portage"
Apohaqui - A - pa - HAWK means "meeting of the waters"
Nauwigewauk - Naw - WIJ - a - walk "Maliseet name for the river"
Plumweseep - Plum - SWEEP "salmon and river"
Quispamsis - Quis - PAM - sis "little lake in the woods"
* If Daisy, the giant cow at Hwy Exit 195, was producing milk, the annual output of a cow her size would keep the 4,200 residents of Sussex supplied with 1 litre of milk per day for six months! * It takes 12 pounds of milk to make one gallon of ice cream. Then, there are an average 50 delicious licks in a single scoop ice cream cone! * The combined length of Kings County's 16 covered bridges, according to Department of Transportation measurements, is 7,777 feet! How lucky is that! * The Covered Bridge Visitor Information Centre, Youngs Cove, at 72 metres long, is as long as an average inflated round hot air balloon is tall. Sussex, where the accent is on success!